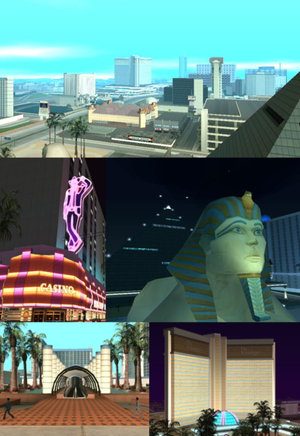 From top to bottom: Las Venturas, Old Venturas Strip, The Camel's Toe, The High Roller casino and The Visage. 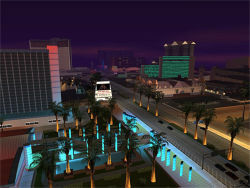 Las Venturas, San Andreas is the third and final fictional city the player visits in Grand Theft Auto: San Andreas. It is based on Las Vegas, Nevada, and like its real-life counterpart, Las Venturas is a gambling city located in a desert region, with casinos such as The Camel's Toe and Caligula's Palace. Everything that can be bought in Las Venturas, at the exception of the Pay 'n' Spray service, is 20% more expensive than in Los Santos or San Fierro. 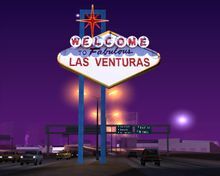 Las Venturas translates to 'The Fortunes' or 'The Adventures', whilst Las Vegas translates to "The Meadows" or "The Grasslands". Las Venturas is home to the famous baseball team, the Las Venturas Bandits, and Greenglass College. The city is also home to Mafia families. Initially, there were three families: the Leone Family, the Forelli Family and the Sindacco Family. The city and most of its features can be accessed once the mission Yay Ka-Boom-Boom is completed, however the ability to purchase safehouses in the city isn't granted until Learning to Fly is completed. After completing dangerous missions in the deserts of San Andreas for Mike Toreno in exchange for his brother Sweet's freedom, Carl Johnson discovers that Toreno has vanished, not fulfilling his end of the bargain. However, after helping The Truth steal secret items from the government, Carl gets a phone call from the blind Triad leader Wu Zi Mu, whom Carl worked with in San Fierro. Wu Zi Mu has opened a casino called "The Four Dragons Casino" in Las Venturas, and he offers Carl part ownership in exchange for defending it, since Las Venturas is a Mafia-controlled town. After stopping the sabotage efforts of the Forelli Family and Sindacco Family, who have part ownership of Caligula's Palace, with the Leone Family, Carl and Wu Zi Mu plan to strike back by pulling off a heist on Caligula's. Carl eventually meets Kent Paul and Maccer, a member of the Gurning Chimps. Paul knows Ken Rosenberg, who is currently the manager of Caligula's. In a different tempo, Carl also does a task once again for C.R.A.S.H., which is to retrieve a dossier for Frank Tenpenny. After some time, C.R.A.S.H. and Carl meet up in Las Brujas, near El Castillo del Diablo in Bone County, to give Tenpenny the dossier. In this event, Tenpenny knocks out fellow C.R.A.S.H. member Jimmy Hernandez with a shovel, since he was going to turn in evidence against Tenpenny. Later on, Eddie Pulaski also gets killed, but this time by Carl. Soon after this, CJ saves the life of disgraced rapper Madd Dogg from committing suicide. and becomes his new manager. However, Madd Dogg wants to return to Los Santos to reclaim his mansion from a drug dealer named Big Poppa. The story then leaves Las Venturas. Wu Zi Mu (in person) and Julio G (on the radio), among others, talk about how corporations are moving in on the Las Venturas gaming industry and pushing out mobsters. This refers to the real-life trend in Las Vegas, also in the very early 1990s ("corporations" being Steve Wynn and Circus Circus Enterprises). Most Las Venturas casinos are modeled after real-life locations in Las Vegas. Curiously, counterparts to some noteworthy Las Vegas casinos which existed in 1992 (when the game takes place), but were later demolished, do not appear in Las Venturas - these include the Dunes Hotel, the Sands Hotel and the Stardust. (The casinos that replaced them don't appear either.) Also, the Luxor Hotel (The Camel's Toe) and Treasure Island Hotel and Casino (Pirates in Men's Pants) had yet to be built. Three casinos, namely The Four Dragons Casino, Caligula's Palace, and Casino Floor, can be entered by Carl Johnson. Inside you will find dealers and casino games along with many pedestrians. These pedestrians will be found ordering drinks, playing the table games (except Wheel of Fortune), standing in front of the slot machines, and making comments regarding the drinks they are ordering, about the table games they play, and about Carl Johnson's appearance. Carl can also gamble at an assortment of table games, slot machines and video poker machines for stakes of up to $1,000,000. A view of some casinos along The Strip. The casinos in the Old Venturas Strip district have no names, but are modeled after the largest casinos in downtown Las Vegas: Binion's Horseshoe, Golden Nugget Las Vegas, Fremont Hotel and Casino, and The Four Queens Hotel and Casino. West side of Julius Thruway. Entrance of Las Venturas Airport. Las Venturas has a large freeway system circling and splitting the city into two. The Julius Thruway is the freeway system circling the city, and is split into four parts; Julius Thruway North, Julius Thruway South, Julius Thruway East and Julius Thruway West. Julius Thruway North leads to an intersection, before splitting into many paths crossing the desert. Julius Thruway South continues to the west from the Blackfield Intersection to become a major highway in the south of Bone County, continuing to the Garver Bridge, and to Tierra Robada and the Gant Bridge. Thus Las Venturas has easy access to San Fierro and Los Santos. It services numerous areas in the city. The Harry Gold Parkway is another highway, splitting the whole city into a western half and an eastern half. It services mainly the airport, some few casinos and the central areas. It also leads to a highway leading to the south, crossing The Mako Span to reach the Montgomery Intersection and becomes the major freeway through Downtown Los Santos, and its most southern point is Los Santos International Airport. The Brown Streak Railroad services Las Venturas, with its two stations (Linden Station and Yellow Bell Station) being located in the northern and eastern part of the city. The Sobell Rail Yards are also in the east of the city, though it is not considered a stop for Brown Streak and Freight trains. Las Venturas Airport is an airport on the south-central part of the city, with two runways and a number of planes. It is serviced by Juank Air, and tickets to Los Santos and San Fierro may be purchased. Las Venturas is home to the Las Venturas Bandits, who aren't based on any real life baseball team, as in the real world ,Las Vegas has never held a major league sports team, in any American pro sport. There is a minor league baseball team, the Las Vegas 51s, but it is likely that the Bandits are not meant to emulate the 51s. 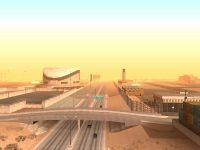 The Bandits play at the Las Venturas Bandits Stadium in the Redsands West district of Las Venturas. Street map of Las Venturas. Terrain map of Las Venturas. In GTA San Andreas, the printed map included with the game implies that The Clown's Pocket Casino was originally named the Ringmaster, which probably means the name was changed during game development. Las Venturas is the only city with no Street Gangs roaming the city, though it has been implied that most of the city belongs to the Mafia. The Venturas Poker Challenge takes place in Las Venturas in the Venturas Dome, during the events of Grand Theft Auto IV. In Grand Theft Auto IV, there are a lot of references to Las Venturas (in television, radio, etc. ), as it still exists within the GTA IV Era. However, as Las Venturas is a city and not a town or area, it is unknown if it still exists within the fictional state of San Andreas, afterall San Andreas is a single city in GTA 1. In early screenshots Police Vehicles in Las Venturas were shown to have the letters "LG" emblozned on them, as apposed to the letters "LV" for Las Venturas. This suggests the at one point Las Venturas was named something else. Accessing Las Venturas before the region is unlocked triggers a four-star wanted level, as usual. There is an exception, however: on the extreme southern side of the city are two small docks, both with boats. These may be accessed from the start of the game without penalty; one of the docks also has an armor pick-up that can also be reached safely. As long as CJ does not attempt to go up the staircases, a wanted level will not be triggered. This loophole (possibly caused by a glitch in the boundary programming) allows CJ a way to access a boat early on in the game. At one point on the map, it is possible for a skilled motorcycle driver to jump from Red County across into Las Venturas before the bridges are unlocked. This, of course, triggers the wanted level. There are videos on YouTube showing how this can be done. This page was last modified on 4 July 2018, at 22:54.